Now, this isn’t exactly a “vinegar” recipe, but if you want to toss in a teaspoon, please feel free…..We are growers of grapes – both wine grapes and table grapes. The table grapes are the Sovereign Coronation. Now, these are lovely grapes with a velvety blue coating and fabulous flavour. 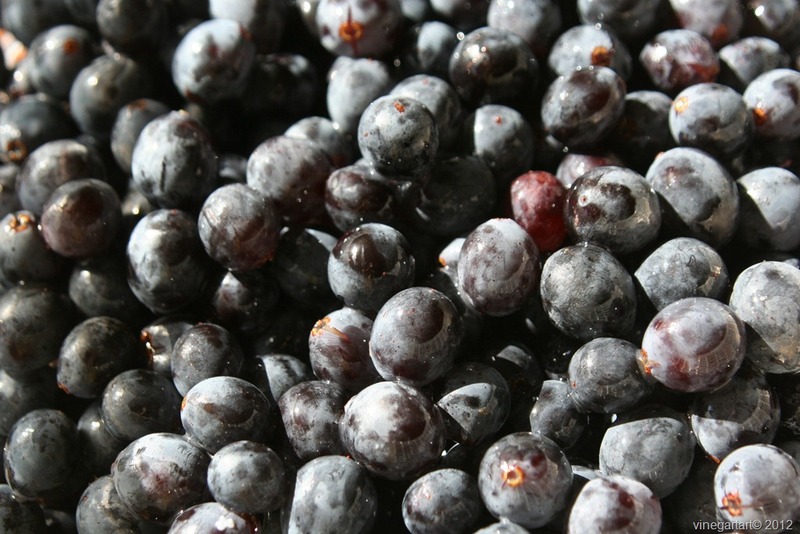 These grapes make delicious juice, pretty pies, juicy jam and jiggly jelly. They are virtually seedless. Please pay attention to the word “virtually”. This means there are some seeds but not many and the seeds are immature – not of the tooth breaking variety. In science speak they are “vestigial” seeds. 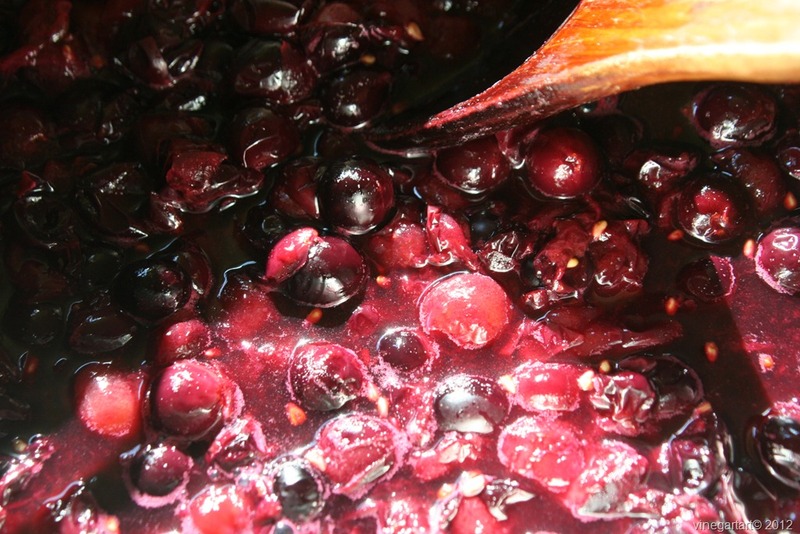 In the interest in science and just because I am of a curious nature, I attempted both the traditional way of making grape jam with seeds and what I like to the call the “Whole Grape No Muss, No fuss” method to see which worked better for Coronation grapes . 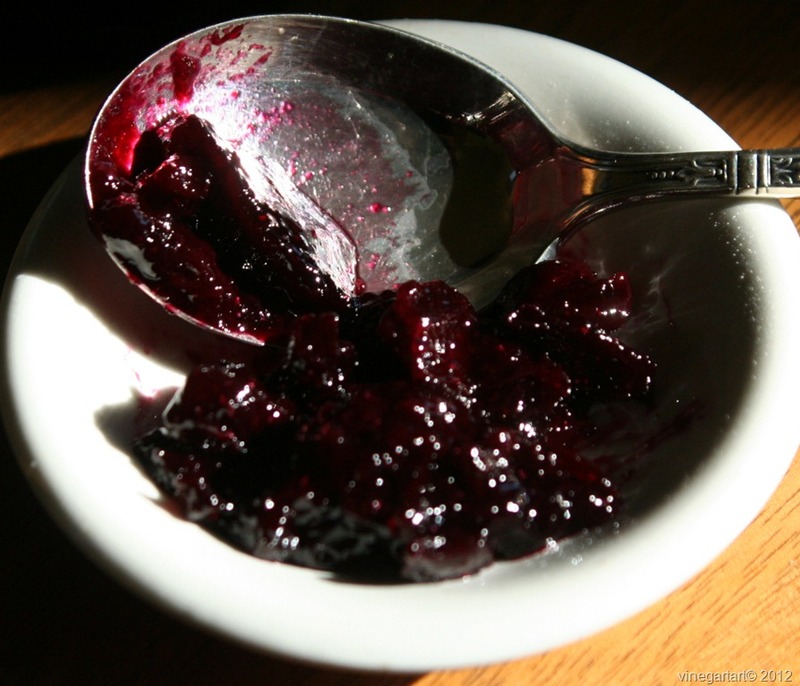 Virtually (see…there is that word again) all grape jam recipes instruct you to pick the grapes off their stems and then, one by one, squeeze the little beggars until the pulp pops out of its’ tight little skin, separating the pulp from the skin. The skins are then put aside. Truth to tell my interest in scientific research started to wane after I had separated one cup of pulp. I only had five more cups to go. I also had three bowls on the go because this pulp squeezing business requires one large bowl for the whole grapes, one bowl for the skin and one bowl for the pulp. 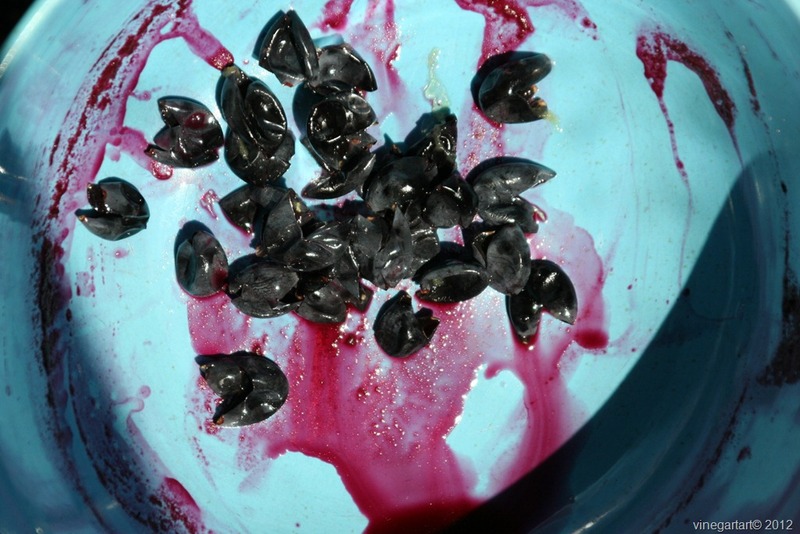 In the interest of time and to remind myself that I do actually have a life, I jettisoned the idea of using the traditional method of separating the skins from the pulp and went directly to the “put the whole grapes in a large pot” method. Much less work and fewer bowls. Makes about 5 cups purple blue jam with intense grape flavour. 1. Sterilize 5- 1/2 pint jars, rings and lids. 2. 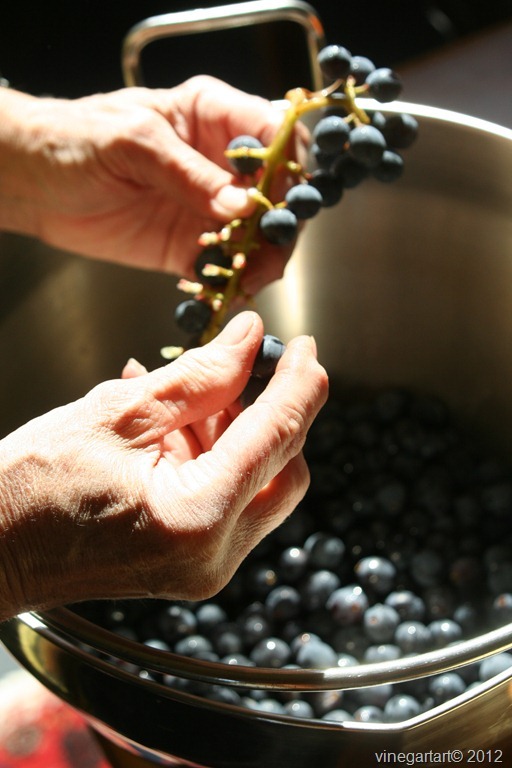 Wash grapes and pick grapes off their stems dropping them into a large pot. 3. Place the pot of whole grapes over medium heat and bring to a gentle boil stirring occasionally. Cook gently for 15 to 20 minutes. Okay, in this picture you can just barely see a few seeds. Remember, I said Coronation grapes are virtually seedless. In six cups of grapes you will find less than one tablespoon of seeds. In past years I haven’t even bothered removing the seeds. This year, however, I am removing the seeds – for you. As the grapes break open remove the seeds as they cluster around the edge of the pot. If you miss a few – so be it. Believe me, this is much easier than squeezing pulp. 4. Gradually add the sugar one cup at a time. Bring grapes back to a rolling boil. Cook rapidly for 10 minutes stirring frequently. Remove from heat. Ladle hot jam into hot jars, leaving 1/4-inch headspace. Run a clean, wet paper towel around the rim of each jar to ensure the rims are jam free. Place a lid and ring on each jar and tighten the rings. Let the jam cool and seal. You will hear a pleasant “pop” as the lids seal. Any lids that don’t seal properly should be refrigerated. In deepest, darkest winter, breakfast can be transported back to a brilliant autumn day with this deeply flavoured jam. What you accomplish with the recipes I share with you is what makes me eager to share more. Tell me how you are doing. Thank you for following. Hello Vinegar Tart (AKA Kim) – happy to see that you are still “jammin'”. Must be a busy time of year for you. I have moved back to the centre of the universe (close to Toronto), actually Stratford, but I will do my best to find these grapes of yours (I’m thinking the Niagara Escarpment might be a good source). I will miss snowshoeing with you this winter. Hope your elbow has healed. Hi Elaine. Thanks for writing. I do know that the Okanagan “Coronation” grape is now grown in Ontario. You might be able to find some at a Farmers’ Market. My elbow is slowly getting better. The problem is I never give it a rest! I am looking forwarding to snowshoeing again this year. I have been to Stratford. It is a charming place. Good luck! I don’t normally put in any water. By the time I have a pot full there is some juice in the bottom of the pot anyway. Just bring to a boil slowly as the goodness seeps out of the skins. Thank you for clearing that up! I look forward to reading your new and older posts.